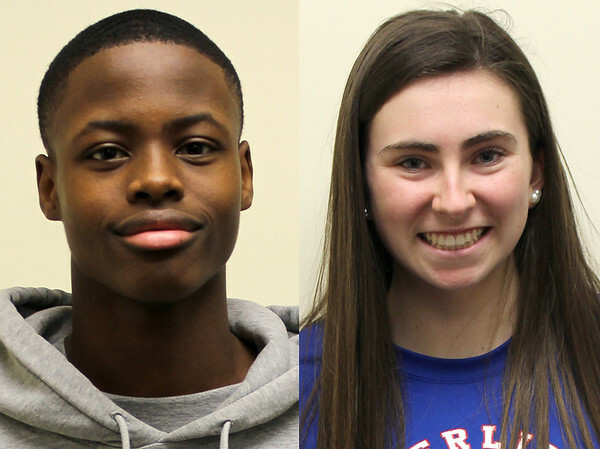 Two athletes sparkled on the hardwood in last week’s action, as Innovation boys basketball’s Lenny Okonya and Berlin girls basketball’s Ashley Wenzel put up spectacular numbers en route to Athlete of the Week honors. The Innovation boys basketball team is riding a seven-game winning streak entering the week, thanks in large part to 6-foot-4 senior Okonya, who continues to be a force on both ends of the floor. Last Monday night was no different, as Okonya posted a triple-double that included 10 blocks in an 82-47 rout of Achievement First. While opposing team’s have to worry about Okonya’s shot-blocking prowess on the defensive end, they also have been trying to slow him down on offense, where a heightened sense of aggression has made Okonya a scoring threat from anywhere on the hardwood. Lance was most impressed by Okonya’s rebounding and scoring ability in the win against Achievement First, especially given the quality of opponent. The 10 blocks against Achievement First was a career-high for the senior, who has realized that he can block more shots when he remains aggressive and seeks opportunities out. Against Achievement First, he sniffed out every last one. The Berlin girls basketball team is currently boasting a winning streak of its own, having won each of its past four games heading into Monday night’s road matchup against Newington. A major catalyst behind the Redcoats’ recent surge has been the play of sophomore Ashley Wenzel, who dropped 20 points in Thursday’s win against Ledyard, while shooting 62 percent from the floor. Since the beginning of the season, Wenzel has embraced her ever-increasing role in the team’s offense despite being an underclassman, and has been thriving of late. Prior to her 20-point performance, last week, she poured in 18 points in another win against New Britain. King raves about Wenzel’s insatiable desire to improve her game, noticing the upstart sophomore staying behind after practice to work on her craft, while the rest of the team hits the showers. The extra work has paid off, as Wenzel has averaged 18.5 points per game over the past four contests, all of which have ended in wins for Berlin, which was 13-3 entering Monday night’s game against the Indians. As the coming games get bigger and more important for Berlin, King will likely be leaning more heavily on her budding sophomore with both the CCC and state tournaments approaching. So far, as Wenzel has demonstrated so far, she has been more than up to the challenge. Posted in New Britain Herald, Athletes of the Week, Innovation, New Britain on Monday, 4 February 2019 21:19. Updated: Monday, 4 February 2019 21:21.